The D of E practice expedition was a challenge for all, both mentally and physically but it was also a chance to bond with people you may not have talked with very much inside school. For my group, it was a chance to get to know people better, flatten out our differences and work together as a team which I believe we accomplished very well despite a few hiccups along the way. The first day went reasonably well for us as we reached our first checkpoint late but in one piece! 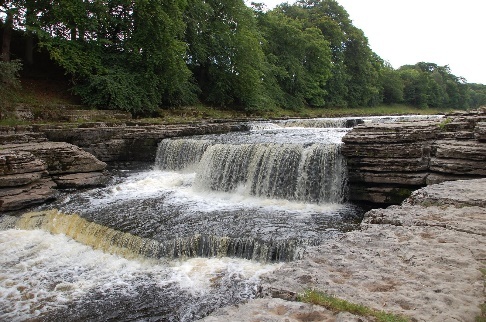 After this our team navigated our way to the campsite through Bedale and past Aysgarth falls, in which we took a break and the girls sat on the rocks gazing at the beautiful waterfall whilst the boys and I proceeded to skim rocks on the water. This was one of my favourite parts of D of E because it was calm and we all enjoyed the time without the great weight on our backs! Upon arriving at the campsite we met with the rest of the groups and we all told each other of how our walks had gone, most went well but the latest group came in around 6:30 after a few detours and a trip to A and E! We all helped each other put tents up but some people were much better that others at this job so the rest got onto cooking our tea for the night. Apart from a couple of mishaps with boil in the bag rice my team managed to have a good meal and some hot drinks as it got dark and the first day came to an end. The second day, however did not go as planned. We started off well (despite leaving a bit late), after getting up at a good time, cooking, cleaning and packing to go as a team but as soon as we reached the checkpoint we were sent on a detour and that’s where it all went wrong! After going much further down a straight and taking a wrong turn, we ended up walking up, what seemed like, one of the 3 peaks! We did, however meet up with another group, who’d also fallen into this situation and with a little guidance from Mrs Swann, we made it back to the bus. Despite the mishaps of the second day, I still really enjoyed the expedition and I think the situation made us closer as a group as we had to support and listen to each other to try and get out of the problem we found ourselves in.